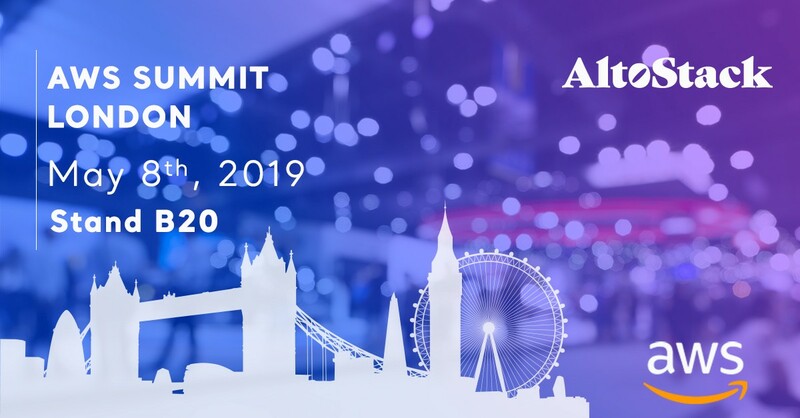 AltoStack is proud to be a sponsor of the AWS Summit event in London on May 8th, 2019. Visit AltoStack at stand B20 at the AWS Summit London. The AltoStack team of AWS certified DevOps, and cloud experts are excited to meet you to discuss how AltoStack can transform your ways of working through DevOps and cloud native computing and learn from our most successful digital transformation projects, and how we drove business outcomes. As an AWS Advanced Partner and AWS Solution Provider, our full spectrum of digital transformation and cloud services allow you to take the first steps of your Cloud and DevOps journey and accelerate your company’s digital transformation and empower your business to stay ahead of the competition. We offer a full range of services from strategy and planning to design, implementation, transformation and ongoing DevOps and Cloud management partnering with you at all stages of the process by combining our business expertise with the latest technology to continuously deliver true business value. If you cannot make it to AWS Summit London this year, stay tuned for many other events that AltoStack will be sponsoring throughout the year. Or, connect with us to learn how we can help your journey to cloud and adopt DevOps. At AltoStack, we’re revolutionising the way businesses innovate and grow through our technology products and consultancy services by providing a much more efficient, experienced and affordable way to operate on the Cloud and adopt DevOps without the need for internal hires. Our full spectrum of digital transformation and cloud services allow you to take the first steps of your Cloud and DevOps journey and accelerate your company’s digital transformation and empower your business to stay ahead of the competition.